The Bloomin' Neggs Neocash event aims to get Neopians out of their Neohomes and into their Neogreenhouses! It's time to get those green fingers grubby and plant some Neggs with Flora, the Acara host, in order to receive Neocash prizes! This event runs from April 3rd to 11:59:59 PM NST April 22nd, 2014, and can be completed on side accounts. For full details, please refer to the official FAQ. Planting Kits will be released over the course of the event, allowing the growth of four Neggs! The four kits are Striped, Argyle, Wavy and Tartan. 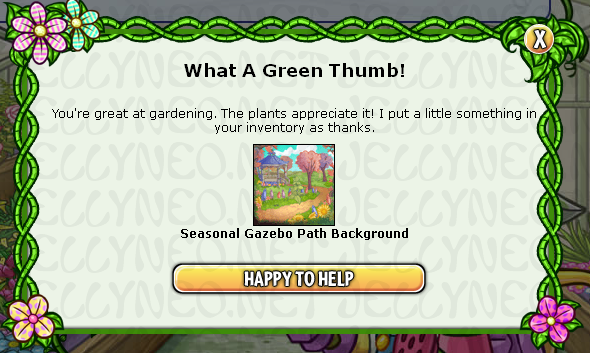 After purchasing a Planting Kit from the NC Mall you'll need to activate it from your Inventory, or when selecting the corresponding plant pot on the main Bloomin' Neggs page. You'll only be able to activate one of each Kit, so be sure to double-check when purchasing that it is the correct one, and not a duplicate already used. With your Planting Kit activated, gloves on and trowel in hand, it's time to actually grow some Neggs! Select the appropriate pot on the left of the screen to load it onto the counter. If the pot on the left is yellow , that means there is a prize available! Simply click on the pot on the counter to participate. This will reveal a popup, awarding the prize, and updating the image for the Negg you're growing. Each of the four Neggs takes five days to complete, so be sure to return each day! As Neggs are magical, it doesn't really matter if you don't get a chance to tend to it daily, as you'll be able to back-track should multiple days pass. There is an extra plant pot on the right counter, which updates every time a Planting Kit is activated. This represents the bonus item available at the end, which can only be collected once all four Kits have been activated. Prizes are awarded daily, when tending to the Negg you're currently planting. A bonus will be available to those participants who activate and plant all four Neggs!